Shallow water fishing can mean many things to different guys. Depending on the body of water, area of the country, species or fish, or fishing style determines what is shallow water fishing. In this article I am considering shallow water to be under 8 feet of water. Throughout this article I will discuss the importance of stealth, methods of anchoring, and times of year to fish shallow. This article is not so much a lure selection or species specific based article, but more of a general why you should try fishing this depth and what will make you more successful. First, let us talk about the importance of being stealthy. One of the problems most shallow water fisherman have is that they make too much noise and spook the fish. Some of you are saying fish down have ears. You are correct in assuming that, however, what you need to know is that every noise sends out vibration. There are good vibration and bad otherwise none of our lures would have rattles built-in or attached. Let’s start with out outboard motor. As a rule of thumb, I recommend not running your outboard motor in shallow water that you intend to fish. Shut the motor down 50-100 yards before the area you intend to fish. From there use your electric motor to approach the spot. These motors are essential in shallow water fishing. These motors are relatively inexpensive and can be found in most sporting goods shops. Boat noise is another issue. This is a bigger issue if your boat doesn’t have carpeting. Remember your noise you make will transmit through the hull of the boat. Some other noise makers are anchors, radios, depth finders, and talking loud. Next, we should discuss the options that we have when it comes to anchoring your boat. When you get onto a school of fish in shallow water often the best thing you can do to ensure you keep catching fish without disturbing them is to anchor the boat in place. By doing this you will eliminate the need to use both the electric motor or your outboard motor. First, there is the convention anchor and rope. This method will work at almost any depth depending on the length of your rope. Anchors can be bought in various sizes and shapes. Anchors can be made easily by using a coffee can and pouring concrete into it. This system is probably the most inexpensive method of anchoring your boat. Simple and easy as this method seems you should consider a few negatives. Depending on the bottom type the anchor may never hold. If the anchor doesn’t hold you in place then it will drag acrossed the bottom creating noise and muddy water conditions. If you are using an anchor set it in the water slowly by lowering the anchor straight now. That is the quietest and most subtle way to use an anchor. Another anchoring method is to use a hydralic or electronic anchoring system. Multiple companies now make a system that pushes a fiberglass rod down into the ground. These systems are very efficient and stealthy ways to anchor. With the push of a buttom or flip of a switch the anchor will lower to the bottom. Most of these systems will anchor boats in water up to 8 feet. The most common area to mount this system is by the outboard motor. If the water is shallow enough waves will not effect the effectiveness of the product because it will constantly adjust to hold you in place. Obviously, there is only so much one of the products can take in the wind and rain, but in those cases shallow water typically isn’t your best fishing option. The only downfalls of these products is that you pay a premium price for the product and they are big and bulky. My favorite way to anchor my boat is with a Dig IN Shallow Water Anchor. This is a very simple but effective system that has recently been release to the market. The aluminum bracket comes in a bow or transum mount. The bow mount works well with the bow mounted trolling motor because once you position the boat you slide the 8-12′ fiberglass rod through the bracket and push it into the ground. The stren mount works better if you have two people on the boat, or if you have a transum mounted trolling motor or no trolling motor. 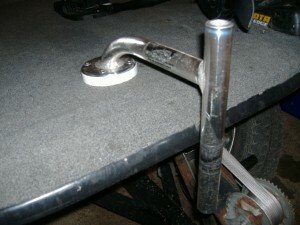 Both of these mounts are very quiet and inexpensive when compared to the hydralic anchors. The other advantage of the Dig-In system is that the fiberglass rod also doubles as a push pole. The question that I get the most about shallow water fishing is, when can or when should I fish shallow? My answer to that question is answered by asking more questions. What species, what area of the country are you in, what type of fishery are you fishing, and what is the water clearity and lake conditions. 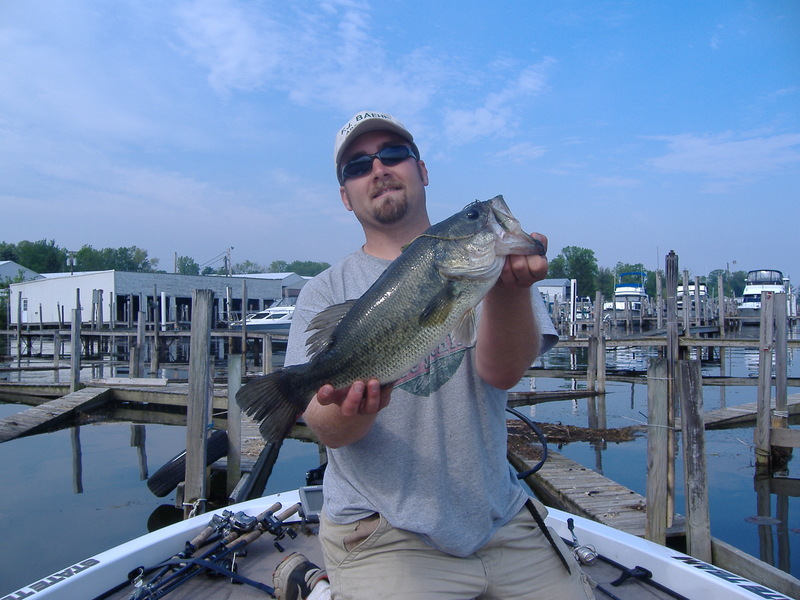 The spawn is the time of year for any species that they majority of the fish will be shallow. During the prespawn fish will be feeding in shallow and during the spawn they will be positioned on their nests in shallow water. However, there are always some amount of fish in shallow water. Typically, these fish are feeding and active so catching them can be easier than finding deep structure. However, the size of the fish isn’t always that great. Targeting shallow weeds, laydowns, docks, and rocks and be effective areas to look for fish any time of year. The two worst times of year to fish shallow are in the dead heat of summer, and the winter months. This doesn’t mean that there aren’t fish shallow, but more productive water can be found. The type of fishery will make a difference as well. River fish tend to stay in shallow current for most of the year. Only in the winter will they retreat. 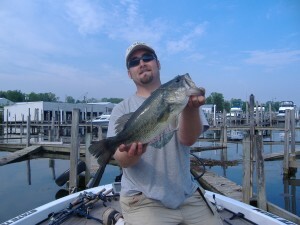 Ponds and smaller lakes often don’t offer deep water so your best bet is to fish in the early morning or late evening. Lake conditions tell me whether I am going to focus on shallow water or not. The water temperature will help you determine if the fish will be shallow. That being said evening is 40 degree and 90 degree water temperatures I have caught fish in less that 1 foot of water. Success in fishing is all about getting out there on any given day and finding where the fish are located. Too many times have I determined before I went to the lake that the fish will be acting one way and they are in a completely different depth or feeding pattern. Since that is the case more often than not I usually start shallow covering water, flipping and pitching until I have exhausted those options. Typically, I will always find some concentration of shallow fish.